Under Mr. Forbes’ leadership, the company has launched a variety of new publications and businesses. They include: ForbesLife, the dedicated luxury lifestyle and culture magazine; Forbes Europe; Forbes Asia; and Forbes licensee editions in over 30 countries. The company also publishes a number of investment newsletters. In 1996 Forbes entered the new media arena with the launch of Forbes.com. Through March 2014, Forbes.com, a leading business website, reached 27 million unique visitors, according to comScore worldwide. Other Forbes Web sites include: RealClearPolitics.com; RealClearMarkets.com; RealClearSports.com and RealClearWorld.com. The company’s flagship publication, Forbes, is the nation’s leading business magazine, with a circulation of more than 900,000. Forbes combined with Forbes Asia; Forbes Europe and the company’s licensee editions together reach a worldwide audience of more than 5 million readers. Mr. Forbes writes editorials for each issue of Forbes under the heading of “Fact and Comment.” A widely respected economic prognosticator, he is the only writer to have won the highly prestigious Crystal Owl Award four times. The prize was formerly given by U.S. Steel Corporation to the financial journalist whose economic forecasts for the coming year proved most accurate. Mr. Forbes’ new book, Money: How the Destruction of the Dollar Threatens the Global Economy – and What We Can Do About It, co-authored by Elizabeth Ames (McGraw-Hill Professional) comes out this June. His other books include: Freedom Manifesto: Why Free Markets are Moral and Big Government Isn’t, co-authored by Elizabeth Ames (Crown Business, August 2012); How Capitalism Will Save Us: Why Free People and Free Markets Are the Best Answer in Today’s Economy, co-authored by Elizabeth Ames (Crown Business, November 2009); and Power Ambition Glory: The Stunning Parallels between Great Leaders of the Ancient World and Today . . . and the Lessons You Can Learn, co-authored by John Prevas (Crown Business, June 2009). He also wrote: Flat Tax Revolution: Using a Postcard to Abolish the IRS (Regnery, 2005); and A New Birth of Freedom (Regnery, 1999), a book of bold ideas for the new millennium. In 1985, President Reagan named Mr. Forbes Chairman of the bi-partisan Board for International Broadcasting (BIB). In this position, he oversaw the operations of Radio Free Europe and Radio Liberty. Broadcasting behind the Iron Curtain, Radio Free Europe and Radio Liberty were praised by Poland’s Lech Walesa as being critical to the struggle against communism. Mr. Forbes was reappointed to his post by President George H. W. Bush and served until 1993. 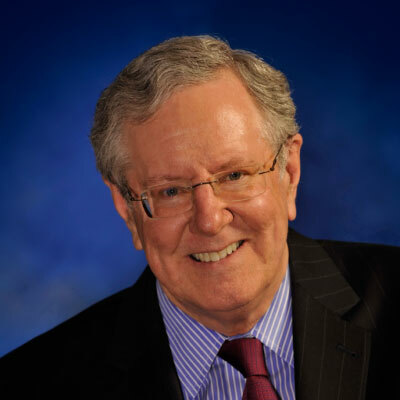 Real Wealth® welcomes Steve Forbes, Chairman and Editor-in-Chief of Forbes Media, and an internationally respected authority in the worlds of economics, finance, and corporate leadership….